High quality single crystals of NpCoGa5 were grown and the Fermi surfaces were observed for the first time in transuranium compounds by the de Haas-van Alphen effect. There are two kinds of cylindrical Fermi surface in NpCoGa5. 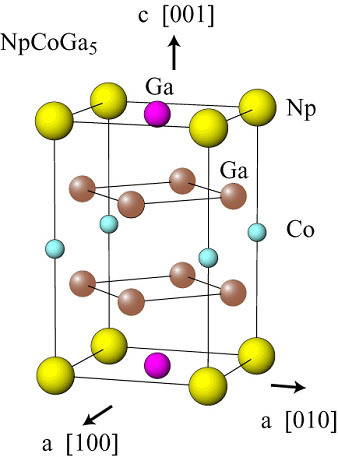 The 5f electrons of Np contribute to the conduction bands, forming the heavy electronic state. The conductive Np-planes are separated by the non-conductive Co-plane, bringing about two-dimensional character. The work has been done in collaboration with JAERI and Osaka University. The result was reported in J. Phys. Soc. Jpn. as a letter, as well as in newspapers of Nikkan-Kogyo (on Oct. 4) and Joyo (on Oct. 6).